If he falls for a beautiful dancer, does he risk his heart? Or his life? Accidents happen. But they happen more often when the beautiful ballet dancers return each summer to the island. When he hears the ruthless way that the loveliest dancer talks about boys getting what they deserve when they break girls' hearts, Harley, home for the summer after his first year of college, wonders if he's losing his mind. He knows for sure that he's losing his heart to this girl...But then, strange incidents start happening all over the island and Harley is caught between desire and fear: could he also be in danger of losing his life? 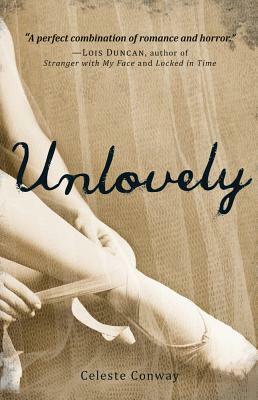 • Unlovely is narrated in dark mystery wrapped around a world teens love, that of dancers and dancing. This novel is for ballet and mystery lovers alike. Cassandra is the willowy, fragile, big blue-eyed ballerina with hair like ‘white silk trailing down her back’ or mounted in a dancer’s bun. She is part of a group of young aspiring dancers taking part in a dance summer school outside NY on the East coast. She is flirting with a local boy called Harley who is living on a boat with his dad and is recovering from heartache. His school sweetheart has gone off with another man while he left for university and he finds out his summer break that not only is she pregnant but is planning to marry the new boy-friend. Harley remains a loyal friend throughout the story as he gets further involved with the mystery surrounding his eerie ballerina girl-friend and her entourage seemingly playing dangerous games with fellow pupils. He also keeps an eye on his ex-girl-friend who is being abused and in difficulties. The undertone is set by the rehearsals of the famous ballet classic ‘Giselle’ and parallels between the story and ‘real life’ are beautifully drawn and make this story original and engaging. The topics covered range from ballet history, romance, the clash between New Yorkers and people living in a small seaside town, abuse and alcoholism and the dangers of anorexia. The pace is tight and engaging and the characters well drawn. Review by mother and daughter duo, Helene & Shona Tiernan. Both are avid readers of fiction, enjoying a wide range of topics. Helene is a former journalist, a trained yoga teacher and also enjoys putting pen to paper herself. Her daughter Shona is a 13-year-old teenager who sings, plays the violin, drums and is passionate about tap dancing and her little brother. Both love diving into different worlds through the eyes of an author. Originally from Belgium, they currently live in Portugal with their family.